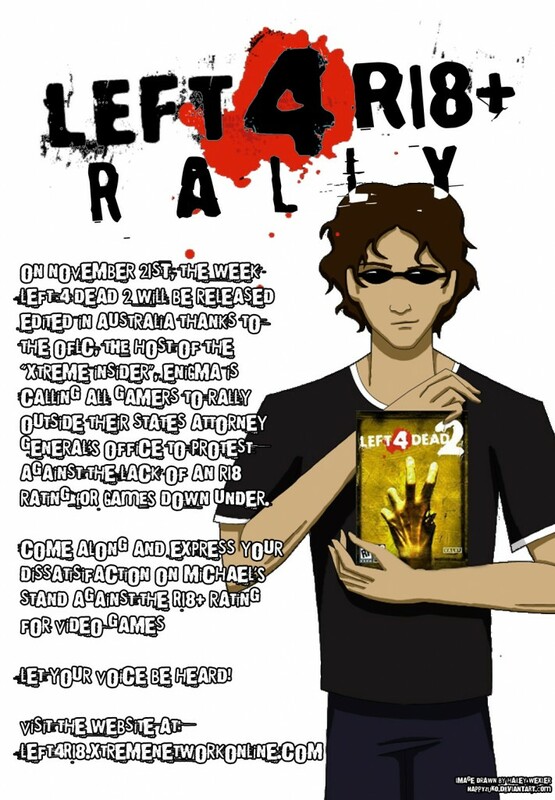 Left 4 R18+ Rally Imminent! Left 4 R18+ Rally organizer Nick ‘Enigma’ Gipson is asking people to raise awareness in a non-violent way and while he is expecting a good turnout this Saturday he is hoping for this rally to pave the way for even bigger ones later on. Remove Michael Atkinson from the R18+ decision! Release the R18+ discussion paper! 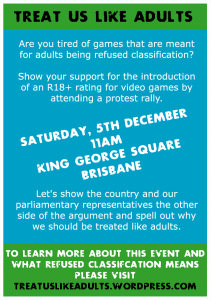 Let the public vote for whether or not the R18+ should be brought in! Make Attorneys-General decisions pass with a majority vote rather than an unanimous one! The rally will be held at each states Attorney-General office. It will begin on Saturday the 21st of November at 11am and finish at 5pm.